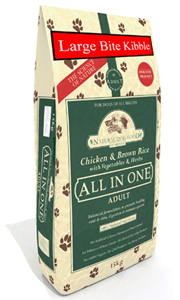 The Natural Dog Food Company products have been around in one form or another for several years. 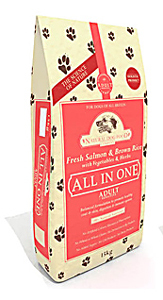 They differ from most natural pet foods in that they do not have a vitamin and mineral mix added to the recipe, and the company state that despite this the product can still be classified as complete, based upon the ingredients used. There's a range of products covering puppy to senior and where possible they use UK sourced ingredients. The range is naturally preserved, using similar antioxidants to other natural products, contains a mix of cereals including brown rice, and in most of the range they use both meat meal and fresh meat. From a protein and fat point of view these are on the low side, similar to Burns at 20% and 8.5% respectively for the adult foods, so they would be ideal for a dog which had problems maintaining body weight, or needed to lose a few pounds. Food produced for the Natural Dog Food Company does contain some good quality ingredients, but choosing the food depends on whether you are happy to feed a food that does not contain the balanced mineral and vitamin supplements that almost all pet food manufacturers and brands include. The food is not cheap compared to many natural foods readily available from pet shops and online. Expect to pay £56+ for a 15kg sack.